Busway. 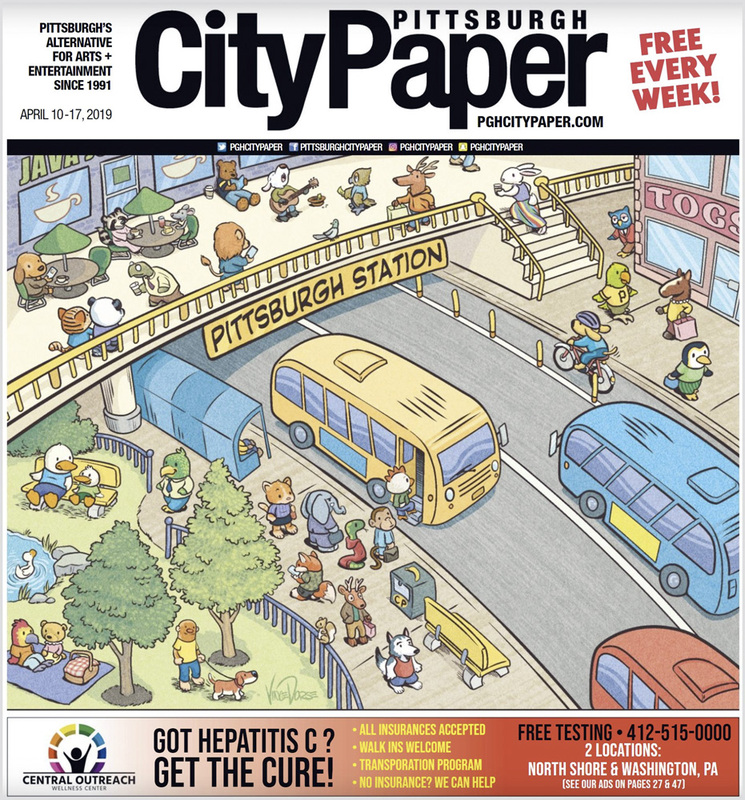 A Pittsburgh City Paper Cover. I had a lot of fun with this one. 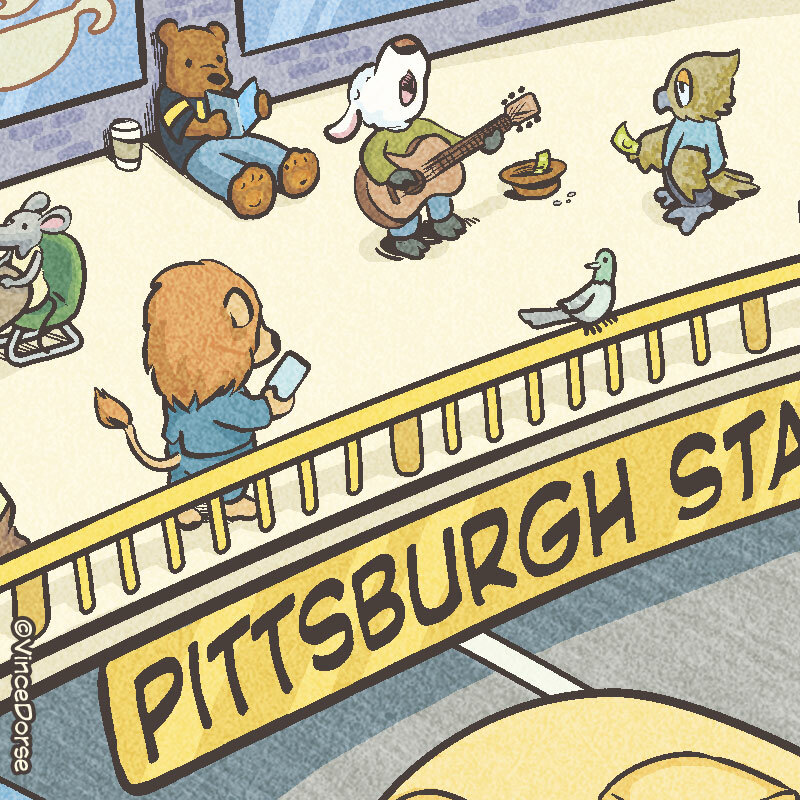 The City Paper’s editor, Lisa, wanted an illustration for a cover story on Pittsburgh’s Busways. 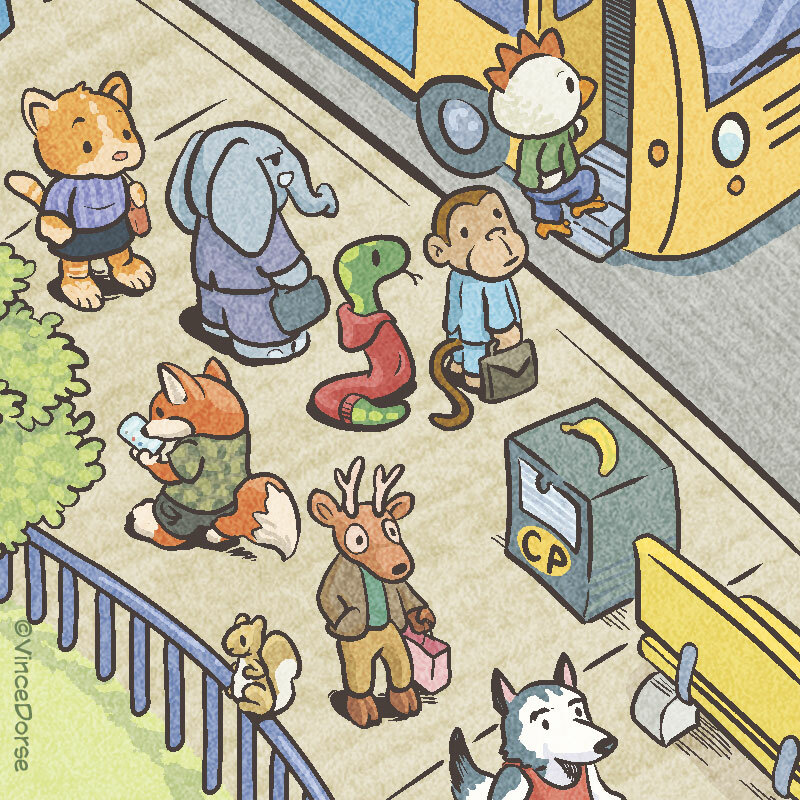 And she wanted it to evoke that kidlit feel of something like a Richard Scarry book (with anthropomorphized animals going about their daily business). 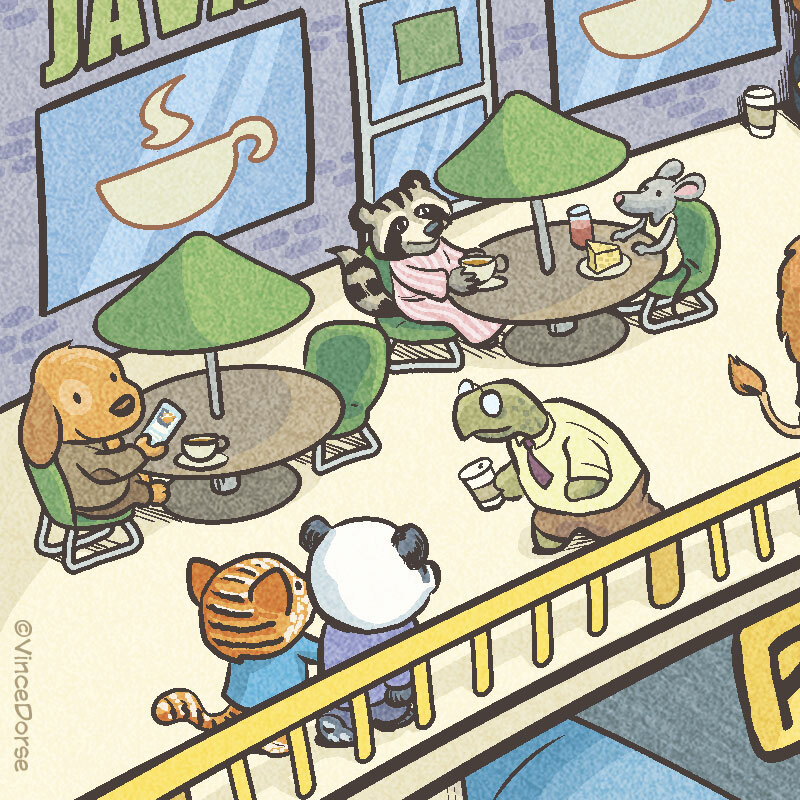 I also thought about those hidden picture puzzles in Highlights while I was setting up the composition. Just a lot of little things, all going on at once. I used Clip Studio Paint for this illustration. Here’s my process. This was all sketched loosely in Clip Studio using the Blue Real Pencil. I just wanted to get something down quick to get approval from Lisa. Once she and the writer hammered out a few details, I was given the go-ahead. Inked in Clip Studio, with various inking tools. The most important tool at this stage were the Curve Rulers. I used those to ink all of those long, sweeping, curved lines (on the guardrail, sidewalks, roads, etc) and to help keep the lines of the buses and windows smooth. I used a couple layers in Clip Studio to keep the flat colors and the highlights/shadows separate. I do this mostly so if I change my mind about one or the other, I can make tiny changes without having to redo the whole thing. The tortoise here is being trailed by a hare (running up the stairs) that just can’t catch him. As usual, the tortoise wins this race. March just wrapped up, so I had lions and lambs on my mind. I also threw in a bear with a Steelers jersey. Gotta rep the local sports teams. 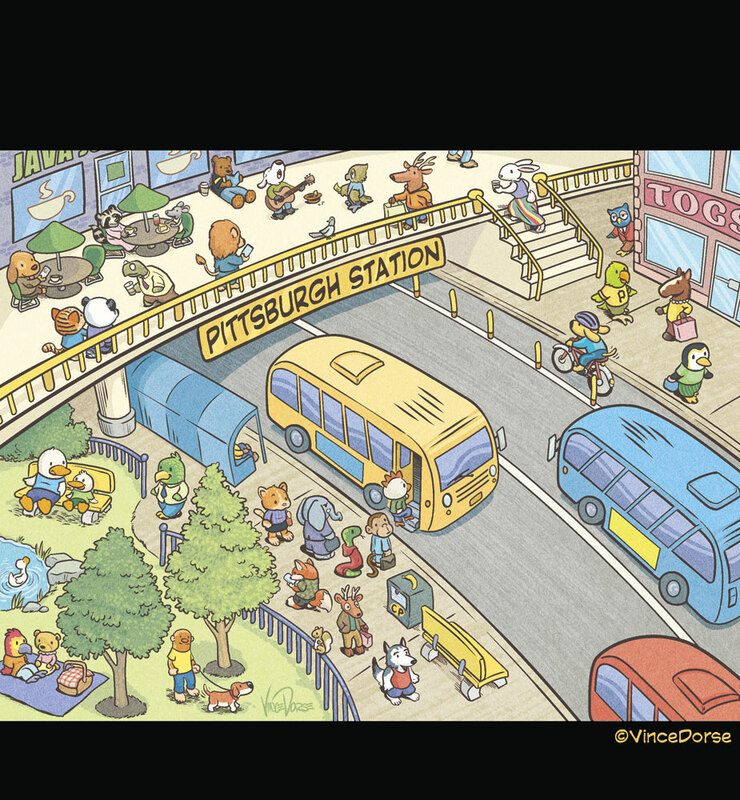 In this section, the Pirates and Penguins get a nod. So does Pittsburgh legend Mister Rogers. 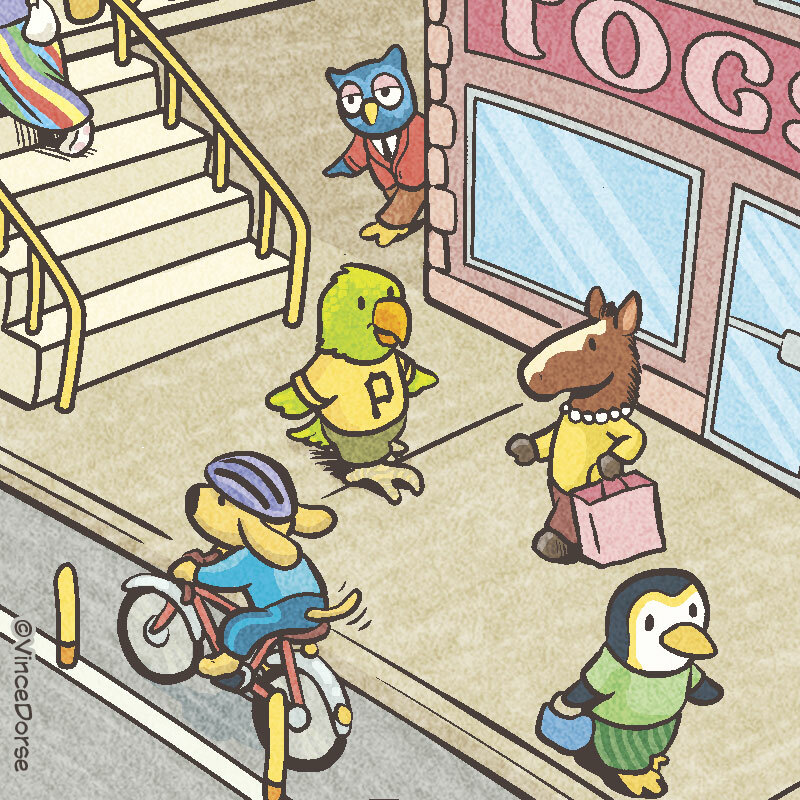 His X The Owl character is going about his day wearing a classic Mister Rogers sweater. The City Paper was kind enough to throw me this gig, so I made sure to put a CP Newspaper box in the picture. It was also a convenient place to put that banana the monkey’s so interested in. Oh, and that chicken? Originally, he was ‘crossing the road’ but that’s one of those edits they made at the paper. No crosswalks on busways. So now chicken’s riding the bus. I guess there’s more than one way to cross a road. 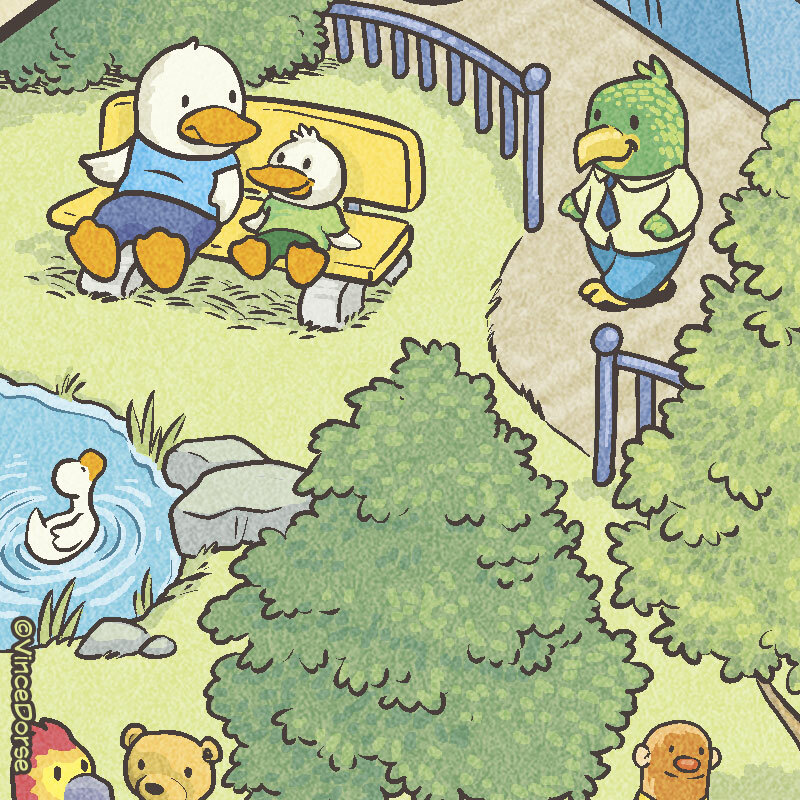 Ducks feeding ducks, a teddy bear at a picnic, just another pleasant day in the park. And is that a familiar friend in the bottom right? Yup. 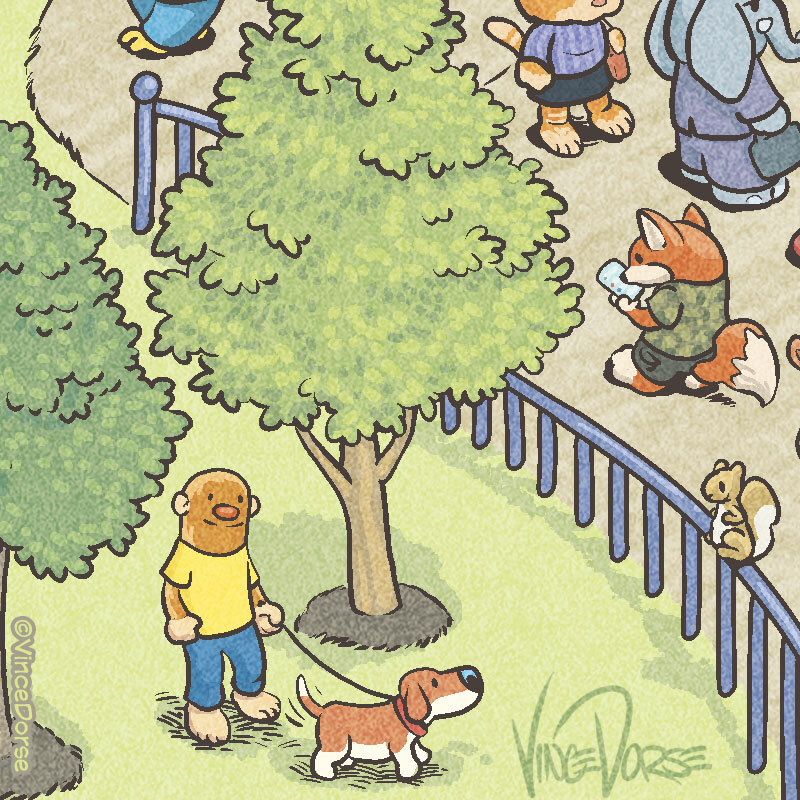 I snuck in alternate universe versions of my Bigfoot and Scout characters (and even their squirrel pal, Squeaky). It’s a friendly city. I’m sure Bigfoot would feel right at home here. 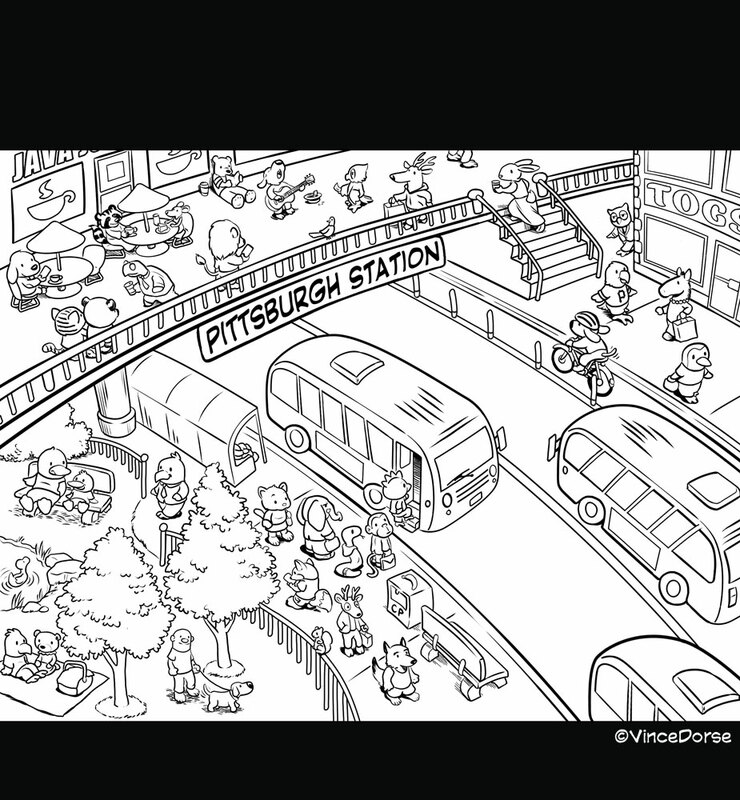 Pittsburgh City Paper came calling last week to see if I’d do another cover for them. As art director/managing editor Lisa Cunningham explained it to me, this cover was going to represent a combination of a few things: the start of Pride Month, the release of an upcoming documentary on beloved Pittsburgher Fred Rogers, and the point at which those two entities intersect — Mister Rogers’ radical history of accepting all types of people and minorities before it was commonplace. I didn’t have to do much layout work for this image because Lisa wanted it to echo the feel of a much-later photo of Fred Rogers where he’s shown welcoming friends to the Neighborhood of Make-Believe. 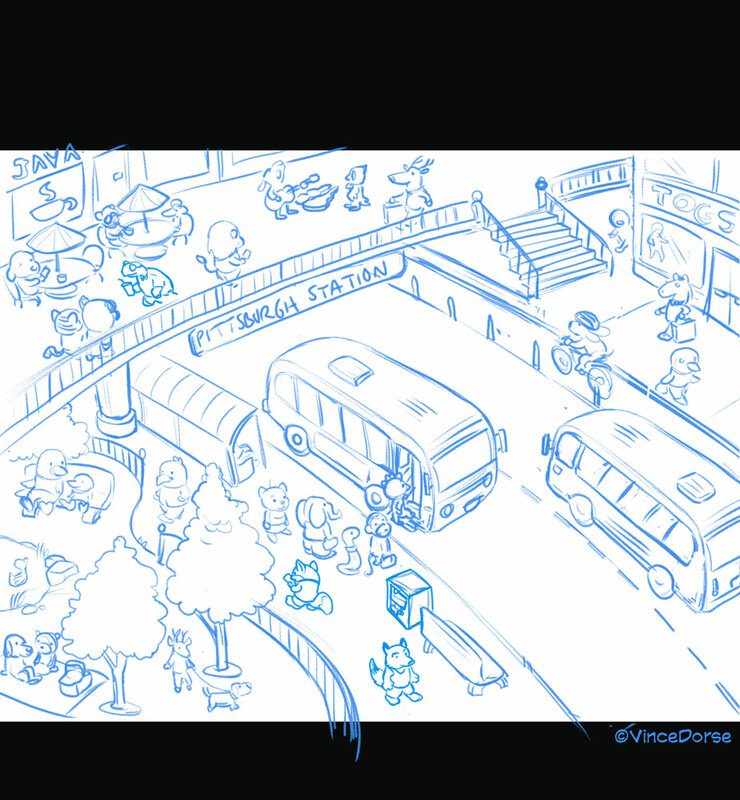 I did a quick, blue-pencil sketch in Clip Studio to map things out. And then I went in with a pencil tool to work out the caricature. Initially, I was going to go over the pencils with a digital inking, but the sense I get from Mister Rogers’ Neighborhood is a very warm, soft, gentle feeling. So I thought I’d leave the pencil work as the final line. After that, it’s all about adding color in Clip Studio. Again, I chose tools that might have a softer feel — pastels, colored pencils. Initially, the job called only for Mister Rogers and Trolley. But he seemed a little solitary in the Neighborhood of Make Believe, so after handing in the assignment I requested a chance to add in some of my favorite neighbors. It just seemed like a happier scene with everyone in there. Of course, I always leave a little extra in the composition because I never know how Lisa’s gonna crop/edit the illustration to fit the needs of the cover text and masthead. I like what she did with it this week, masking around the castle turrets.